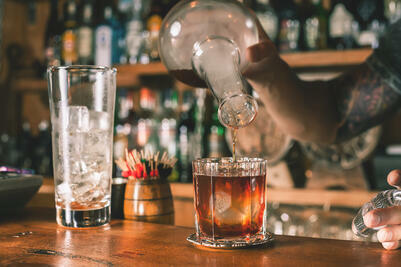 Posted in Bartending, Cocktails, mixology, Recipes, Industry & Culture . 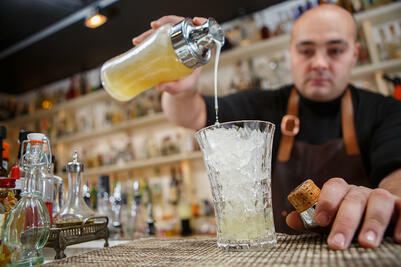 Every bartender, whether professional or weekend warrior, can always stand to learn a new trick. And we could all do a lot worse than starting with recipes concocted and rejuvenated by a team that’s won awards for World’s Best Bar, World’s Best Cocktail Menu, World’s Best Drink Selection, and Best American Cocktail Bar. We are writing of course about The Dead Rabbit Grocery & Grog, and their phenomenally written Dead Rabbit Drinks Manual. Written by founder Sean Muldoon, bar manager Jack McGarry, and Ben Schaffer, The Dead Rabbit Drinks Manual is a weighty and beautifully designed tome. Featuring not only a vast array of recipes, both archaic and modern, but also the fascinating history of Muldoon and McGarry’s rise to the top of the cocktail world, the book feels less like a simple recipe guide and more like a grimoire of mixological mastery. Histories of not only the aforementioned Muldoon and McGarry but of every single drink in the collection, ranging from fizzes to toddies to group-sized punches to an entire chapter on absinthe provide valuable knowledge for both the cocktail newbie and the master bartender dispensing sage wisdom to patrons. Anecdotes, gorgeous photos and images recalling the Gangs of New York style Muldoon and McGarry aim for in their establishment, and a truly astonishing heft and texture to this book lend it a weight not just of knowledge and collected wisdom but a tactile feeling of import and occasion. Starting with perhaps the simplest, most recently illegal recipe in the book, American Style Absinthe is a blend of California St. Germain Absinthe, chilled water, and sugar syrup. But, it is not complexity that creates a great cocktail, but balance. The syrup and water distill and and balance the stronger flavors of the sugarless absinthe and make a much lighter drink with a satisfying kick. Bonus points for having a high bang for buck ratio as the drink can be created in seconds, especially if you make the syrup ahead of time. As a sidenote, this is also the first cocktail in which I have used homemade simple syrup as opposed to storebought. We are never going back. 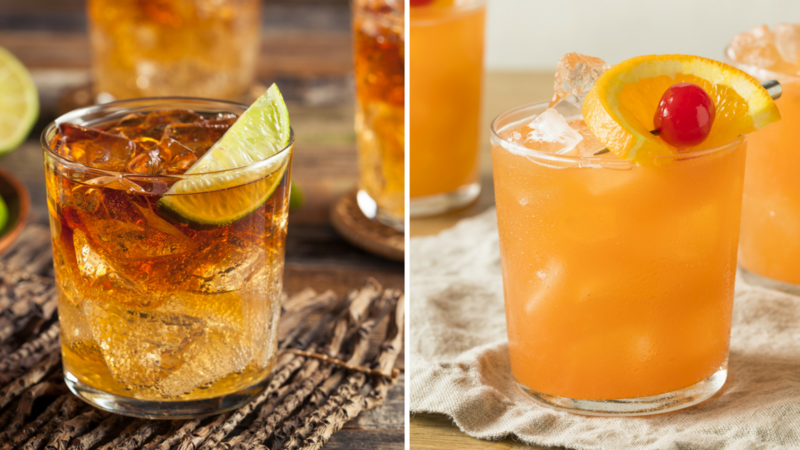 After the stronger flavors of the absinthe, the next chapter on the list was “Sours and Fizzes.” This chapter maybe more than any other featured updated and modernized versions of classic drinks whose recipes sometimes dated back more than a century. Maiden’s Blush is a citrus and fruit infused drink that requires the maker to prepare the ingredients on the side. And so, in addition to simple sugar syrup, we added the raspberry cordial to the list of new things we’d make by hand. The Drinks Manual was quickly becoming not just a collection of recipes or history, but a cookbook as well. Mixing in the cordial, lemon juice, gin, and a small amount of absinthe (which was apparently becoming a fast friend of ours), the Maiden’s Blush is a sweet concoction with a beautifully balanced kick of citrus and Old Tom Gin. So far, so good. For all the different and incredible sections Dead Rabbit has to offer, my favorite is the section entitled Diverse and Invalid Drinks. Born from an interest in drinks historically made as concoctions for the ill these drinks offered selections that were unique, not historically fitting into any of the categories the book covers before this final chapter. Whether created in an airport, by Jonathan Swift, or a cafe in San Francisco, Muldoon and McGarry always wanted an irish coffee in their shop, and this one is exquisite. Irish Whiskey and and the caramel molasses taste of Demerara sugar syrup (again, homemade) create a heavenly blend in coffee sitting underneath a layer of thick heavy cream. They really are right. If there is one ingredient to splurge on here, it’s the cream. We may never leave the house completely sober again. I’m usually a simple drinker. Beer, whiskey, whatever it was I usually drink it straight with very little if any pomp or mixing required. The Dead Rabbit Grocery & Grog Drinks Manual is a treasure. I’ve got post-it notes sticking out of pages and highlighted sections. The history is fascinating to read about. The design of the book evokes a forgotten age of speakeasies and strong drinks.